Congratulations on buying a new home! As you move in and get settled, you may start noticing that your daily mail is a bit more robust than usual. No, it’s not your imagination. 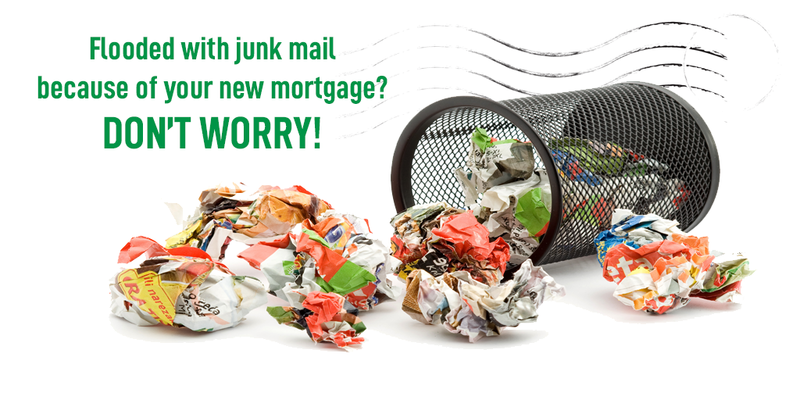 Buying a home and securing a mortgage loan can cause your junk mail to multiply. When you close on your home, the transaction becomes a matter of public record that anybody can access. Information like your name, address, and the loan amount are all readily available. Companies that want to market their services take advantage of this. That’s why you will see multiple offers from insurance, lawn services, renovation and home warranty companies vying for your business. Businesses that want to develop new clients spend marketing dollars to reach people who just moved to the neighborhood. They purchase mailing opportunities from direct-mail companies. They can target certain zip codes or even pinpoint the neighborhoods where they want to market their services. You may start getting mail from tree trimmers, pizza places, tanning salons, and other businesses in close proximity to your new home that you’ve never heard from before. You might be flooded with junk mail, but not all of it is in your name. Unfortunately, some homeowners don’t notify the post office when they move. Their mail takes a while to catch up, and you’re left with a stack that doesn’t belong to you. A simple remedy is to mark it “Return to Sender” and stuff it back in your mailbox with the flag up. In a month or so, those trying to reach the previous owners will get the message and the junk will decrease. Add your information to the database that removes you from all pre-screened offers of credit. This includes credit cards, home equity lines of credit, and other lines of credit. Go to www.optoutprescreen.com to register. Be prepared to share your date of birth and social security number. Doing this will stop pre-screened offers of credit for five years. To stop them forever, you’ll need to opt out by mail by printing the Permanent Opt-Out Election Form and mailing it in. If you change your mind, you can always opt back in to start receiving the offers again. You probably didn’t plan on stacks of junk mail as being one of the changes you would experience when deciding to purchase a new home. It is, however, a common occurrence that many homeowners deal with. Get into the habit of throwing them in the trash instead of letting them clutter your space. If the amount of junk mail stresses you out, choose to opt out and that should take care of the brunt of the problem.